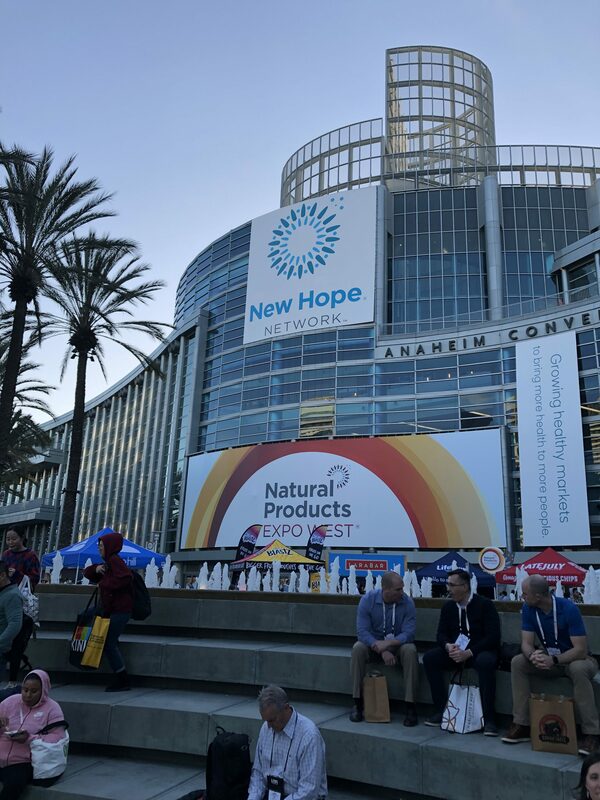 Natural Products Expo West: What We Saw and What You Can Expect to See on Shelves in 2019	|	Food and Beverage Marketing, Advertising and Branding | Brightly creative. | A craft marketing, advertising and branding agency focused in the food and beverage industries. This was my second year at Natural Products Expo West. Last year, I was totally unprepared for what I was walking into. This year, I had to give myself a pep talk before walking into the Anaheim Convention Center compound, and I still could not prepare myself for what was in store. Nearly 90,000 attendees from 136 countries and over 3,600 exhibiting company with the most innovative products in the industry. I propped my feet up on the plane, dosed myself in hand sanitizer from all the meetings and discussions over the three days and dug right into my goodie bag of products ranging from apple cider vinegar shots to wasabi protein chips. I think product trends were as plentiful as the products themselves, but these were a few of my key takeaways. With industrial hemp legalized and CBD working to be a federally approved additive for food and beverage, it is inevitable. Many exhibitors displayed coffee, meal replacement bars, etc. infused with hemp or cannabidiol. I think each aisle had at least a handful of hemp and cannabidiol (CBD) companies. But I couldn’t help but think about Keith’s recent post about formulations and the real challenges of using cannabis in food and beverage products when walking the floor…it poses a real question on CBD products and expansion in the industry. I would say one of the most common products on the show floor was cold brew coffees. But I can’t say that one really stood out more than another one. This might be because I am not a coffee drinker (please hold your gasps), but I actually talked to a lot of these booths and from an ingredient standpoint, they were all the same. Cold brew coffee, water and maybe cane sugar if they were sweetened. There was no real stand out flavors, outstanding branding or anything memorable that made me want to look them up post show. The companies hit the mark for simple, on-the-go coffees but there needs to be some serious stepping up for next year if they really want to stand out. Next year I think I will have to work this into my pep talk before walking onto the floor. This is a natural. products. show. But I think this year, more than last year, companies wanted to showboat what badges they all added to their products: vegan, keto, 0g of this, no added this, free from- that. I was thankful because it slimmed down about 80% of the booths I would have stopped at, but I could see that this desire for badges made the show a lot harder for those exhibitors that didn’t meet “everyone else’s” expectations. Queue my bias/love for honey. Honey is not a vegan product and doesn’t meet keto requirements, so those companies I talked to either chatted up their products beautifully or embarrassingly said they weren’t up to those standards. Stand strong my non-badged friends! If you have sustainable sources and simple ingredients, you are still golden in my book. This Show is BANANAS! B-A-N-A-N-A-S! Okay, maybe not a trend, but there were tons of banana flavored products at this show and I was loving it! From vibrant yellow packaging to flavor packed products, I think I tried enough products to make Gwen Stefani happy.